I’m loving this interviews series with Wanderlust teachers because every time I’ve walked away impressed by the yoga teacher I’ve interviewed. This time, I was talking to Australian bloke Duncan Peak – and he is a bloke in every sense of the word. He went from high school into the military and spent time as a paratrooper. He played professional rugby union. And right through it all, he was practicing either meditation or yoga. Like Amy Ippoliti, Duncan was introduced to yoga and meditation at age 16, and while he didn’t talk about it with his mates at school, it was the beginning of a life-long practice. Post-army, Duncan got back into a more physical practice (he’d been mainly meditating while in the army) to cope with the injuries he’d sustained. He did the rounds of the teachers, spending time in Mysore with Pattabhi Jois, he studied Iyengar, and he spent time with Baron Baptiste (Power Yoga) eventually co-facilitating retreats with Baron all over the world. Prior to speaking to Duncan, I was somewhat wary – I’d read an interview where he described Hatha Yoga as a product he knew inside out, and the marketing speak on Power Living’s website made me prickly. However, as we spoke, it was clear that Duncan knows his stuff inside out – not just asana but also the philosophical under-pinnings of yoga and how to apply it to our daily lives. What most impressed me was his clarity around the necessity of using yoga in running the Power Living business (five studios, two more on the way, and six co-owners). I was sold at that point. Yoga on the mat is one thing, but teachers who understand how to apply that yoga in every aspect of their life always demand my attention. If you’re contemplating become a yoga teacher, I’d highly recommend making it to one of Duncan’s class, as Power Living offers several yoga teacher trainings in New Zealand, Australia and Bali. Finally, Duncan has just released a book called Modern Yoga – find out why it’s called that in the interview below. Click here to see Duncan’s schedule for Great Lake Taupo Wanderlust 2015. 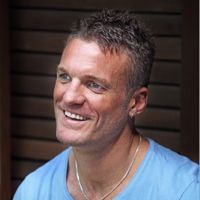 Duncan is the original founder of Power Living Australia. He has developed himself as what he calls to be Modern Day Yogi, training extensively in most contemporary yoga methods – Ashtanga Vinyasa, Iyengar, Power (Baron Baptiste method), Anusara and Yin Yoga. He has travelled and taught yoga in India and been disciplined in his own spiritual development, completing extensive studies in Traditional Yoga Philosophy under Georg Feuerstein, Anatomy and Physiology at the school of Neuro-Spinology and various Psychology and yoga related courses. His dedication to his personal asana & meditation practice is obvious and clocks up well over the 10,000 hours mastery principle he believes strongly in but he also suggests not to take the practice of this too seriously and enjoy life through unattached pleasure. Duncan holds pre and post graduate degrees in Business Administration and served as an Army Officer in the elite Parachute Regiment. Those who spend time with Duncan realize his knowledge is deep, his practice is extensive and most importantly he is driven out of a sincere interest in the wellbeing of others and power of yoga to transform lives. His classes are powerful, strong, fun, heartfelt and his irreverent sense of humor brings a unique lightness to the depth of practice he teaches. He spends his time travelling and teaching between the studios in Sydney and Melbourne and delivering teacher trainings and retreats in Byron Bay and around the globe. Check out his classes and trainings, they rock but get in early as they are usually packed. 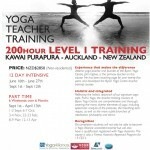 Kawai Purapura's 200 Hour Yoga Teacher Training provides excellent foundations in human anatomy and movement, increases your awareness and understanding of the postures and ensures your teaching is appropriate and safe.